We were four exhausted 20- and 30-something women splitting an UberX from Dulles to the heart of Washington, D.C. — a jaunt that will run upwards of $50 under normal fares. “Can you just Venmo me?” Kelly asked us from the front seat of the sedan. “I only have PayPal,” Elena said in the backseat. We’d just spent a week at the same yoga retreat in Guatemala, but weren’t part of each other’s social orbits back in the city; using a peer-to-peer payment app to split the fare made sense. Part of such an app’s appeal is its ease in these instances. But what followed in the days after the car dropped us off was an email chain 17 missives long as Kelly waited for us all to download the app and find one another on it. It took about as much communicating and momentary confusion as figuring out the bill at a group dinner. The explosion of peer-to-peer payment apps (Venmo, once the indie of the payment apps, processed $700 million in mobile payments in the last quarter of 2014) brings with it new, potentially uncomfortable minefields. While the apps have the potential to subvert old taboos about friends and money, are they simply shifting taboos and new comedies of communication errors onto smartphones? A recent Bloomberg Businesswork story explains that the Manhattan-based startup could be a game-changer for retail and card reading businesses, and its use is spreading beyond large coastal cities. Venmo, and even big companies like Apple, are getting in on the peer-to-peer payment game. Ebay, which now owns Venmo and PayPal, is preparing to take the company public and charge merchants and other new startups to use the service in order to generate revenue. But could it change the friends-and-money game, too? 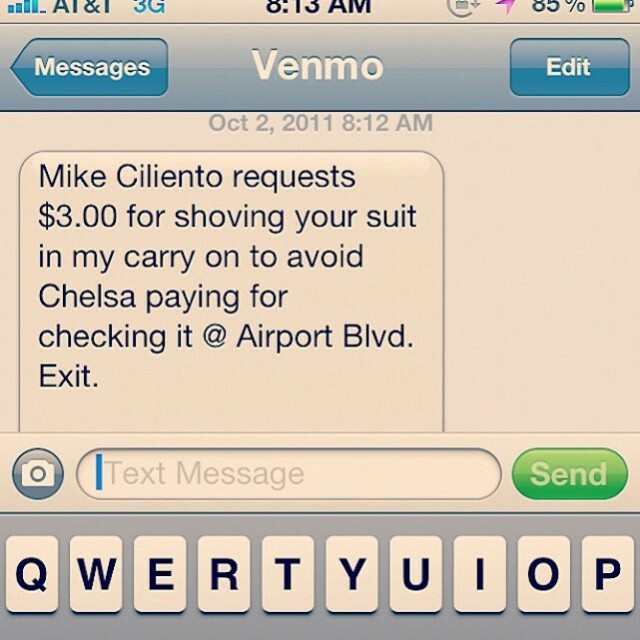 Venmo is still in its infancy, at least as far as establishing etiquette is concerned. Elaine Swann, a New York Times-annointed “Emily Post of the Digital Age,” sees the potential for conflict in the confluence of money, friends and an oversharing internet culture. “You have to be careful when you take money, which can cause a huge chasm between individuals and friendship and then the whole false sense of strength that we have because we’re online — that really can be very dangerous,” Swann tells me. I’m not sure I see the “danger” in such apps, but I’m certainly a skeptic. It started months before the cab ride, when my friend David peer pressured me into downloading PayPal so he could pay me back for $11 beers at baseball games. I was mildly annoyed. I would have gladly let weeks or months pass before David had $11 in cash on hand to pay me back or, better yet, get my beers next time. Now I had to log in and create an account, for a lousy $11. But the app’s immediacy inoculated David from the passive burden of petty debt between friends. He wouldn’t have to remember he owed me, or fear the possibility I might mentally file him away as a freeloading friend. “It’s frustrating when someone owes you money and awkward to remind them of it,” he told me. Plus, he doesn’t have to worry about having the right amount of cash on hand. When thought of this way, I understood. Still, the peer pressure to download the admittedly convenient apps was discomfiting, like a digital passive aggressive refrigerator note from a roommate lingering on my smartphone. Someone else was controlling my digital purse strings by asserting the means through which I should access it. You goddamn luddite, get with the times, they seemed to be saying. Fair enough. Isn’t this how most of our most ubiquitous social apps come to saturate our world — Facebook, Twitter, Instagram, Snapchat, Tinder, and so on? But we’re talking about savings, not selfies and swipes. Things are bound to get awkward. Before, such a process would have been awkward. The guests and I would have fumbled through our wallets, tried to make change, maybe cut a check, and generally tarnished the evening. Etiquette, historically a tool to maintain social order, dictated that such an exchange would be rude and weird. By asking the question, Mark would have seemed jerkish. Are things better when social pressures make Mark feel awkward for asking? The potential for app-shaming is compounded by its social networking aspect. The millennials quoted in the Bloomberg Businessweek piece on Venmo purport to only check out their friends’ transaction notes while passing through the app: “I wouldn’t scroll through Venmo just for kicks,” one says. But the notes tend toward the quippy and emoji-filled — a perfect venue for nostalgia about last night and an inside joke (though it does let you opt out of the sharing feature so you can make your transactions private). The twenty-something staffers over at Quartz recently schooled their older coworkers on the fun of the app. My friend Robert confessed on Facebook that he’d become addicted to the app for its shared notes function: “Am I the only one who likes to look at Venmo for extended periods of time and judge the types of money being exchanged between friends? Someone get this app off my phone because it’s so entertaining. I’ll pay you. Through Venmo,” he wrote. Amanda Palleschi is a writer of environmental policy news, features, essays and notes in the Venmo memo line that will make your mother blush. She lives in Washington, D.C. Follow her on Twitter here.